Chris’s recent appearance on CNBC touched on a broad range of topics – from the US market’s 2019 rally and the role of tech stocks, to the outlook for the pound and our current attitude to portfolio risk. Chris’s latest appearance on Bloomberg covered global growth and the dampening mood over the past year. Chris highlights the importance of the trade talks between the US and China, and the impact of a China slowdown on ‘FAANG’ stocks (Facebook, Amazon, Apple, Netflix and Google). As a finale to 2018, Wealth Manager magazine asked investment managers and CIOs what sorts of new funds they would like to see in the future. Chris Wyllie shared his ideal wish list. Back in 2014 as part of its ‘Cover Star’ series, Wealth Manager profiled Connor Broadley. Four and a half years later and James and Chris were recently interviewed to discuss how the company has flourished in that time. 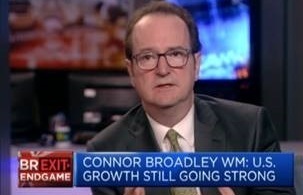 The latest clip of Chris Wyllie on CNBC opens with a chat about how 2018 played out, and how 2019 could well be a year of opportunity. A discussion of the diplomatic dance around Brexit and what might happen when a deal finally breaks cover. Other topics include the budget stand-off in Italy, and prospects for emerging markets and technology stocks after their recent slide. A discussion of our traffic light process, concerns over a trade war and the likelihood, or otherwise, of another recession. Analysis of the Fed’s announcement on rising interest rates and ongoing trade tensions impact on equity markets. Brexit and the recent collapse of volatility in the pound vs the euro. Chris Wyllie’s thoughts about current valuations including Netflix and its possible growth potential. The topic of technology valuations then moves to the value plays of mature businesses and the difficulties of making sectoral assumptions. The European Banking System and the impact of bad debt on balance sheets, and the potential of the US dollar.